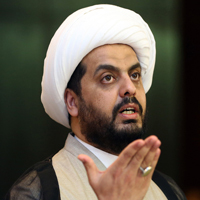 Qais al-Khazali is the founder and leader of Asaib Ahl al-Haq (AAH), an Iranian-sponsored Shiite militia and political party operating primarily in Iraq.Matthew Hilburn, “One-time US Prisoner Now Key in Battling IS,” Voice of America, last modified March 15, 2015, http://www.voanews.com/content/qais-khazali-onetime-us-prisoner-now-key-in-battling-islamic-state/2679431.html. During the U.S.-led counterinsurgency, al-Khazali was one of the most wanted men in Iraq.Eli Lake, “Inside Iraq’s Iranian-Backed Militias,” Bloomberg View, February 4, 2015, http://www.bloombergview.com/articles/2015-02-04/inside-iraq-s-iranian-backed-militias. Al-Khazali’s attacks at the time included a January 2007 attack in Karbala that killed five U.S. soldiers.Sam Wyer, “The Resurgence of Asa’ib Ahl al-Haq,” Middle East Security Report 7 (December 2012): 11, http://www.understandingwar.org/sites/default/files/ResurgenceofAAH.pdf; Iraq Releases Man Held In Slayings of U.S. Soldiers,” CNN, June 9, 2009, http://www.cnn.com/2009/WORLD/meast/06/09/iraq.prisoner.release/index.html?_s=PM:WORLD; David D. Kirkpatrick, “Shiite Militias Pose Challenge for U.S. in Iraq,” New York Times, September 16, 2014, http://www.nytimes.com/2014/09/17/world/middleeast/shiite-militias-pose-challenge-for-us-in-iraq.html. In March 2007, al-Khazali was found and captured by coalition forces. He was released in January 2010 as part of an apparent prisoner-hostage exchange.Eli Lake, “Inside Iraq’s Iranian-Backed Militias,” Bloomberg View, February 4, 2015, http://www.bloombergview.com/articles/2015-02-04/inside-iraq-s-iranian-backed-militias; “Iraq Releases Man Held In Slayings of U.S. Soldiers,” CNN, June 9, 2009, http://www.cnn.com/2009/WORLD/meast/06/09/iraq.prisoner.release/index.html?_s=PM:WORLD; “Man with al-Sadr ties held in attack on U.S. troops,” CNN.com, March 22, 2007, http://www.cnn.com/2007/WORLD/meast/03/22/iraq.main/. Since he was released in January 2010, al-Khazali has continued to lead AAH in both its paramilitary and political activities. When the U.S. military withdrew from Iraq in December 2010, AAH pivoted from attacking anti-American targets in Iraq to recruiting for pro-Assad militias in Syria. According to Guardian Middle East correspondent Martin Chulov, al-Khazali’s speeches have galvanized “thousands” of Iraqi Shiites to fight for Assad’s regime in Syria, worrying many Iraqi communities about “a sectarian conflict that increasingly respects no border.” Martin Chulov, “Controlled by Iran, the deadly militia recruiting Iraq's men to die in Syria,” Guardian (London), March 12, 2014, http://www.theguardian.com/world/2014/mar/12/iraq-battle-dead-valley-peace-syria. As AAH seeks to expand its role into Iraq’s political sphere, al-Khazali continues his sectarian rhetoric. Days before Iraq’s April 30, 2014, parliamentary elections, al-Khazali gave an ominous speech, drenched with “sectarian undertones,” at an AAH rally in Baghdad to 10,000 supporters. ISIS bombed the rally, killing at least 33 attendants including 10 AAH militants who fought alongside Assad forces in Syria.Associated Press, “Shiite rally bombing sparks reprisals in Iraq,” Seattle Times, April 26, 2014, http://www.seattletimes.com/nation-world/shiite-rally-bombing-sparks-reprisals-in-iraq/. Days later in the April 30 elections, AAH’s political party al-Sadiqun (the Honest Ones) ran as part of the State of Law bloc, winning only one seat.Nicholas A. Heras, “Iraqi Shi’a Militia Asa’ib Ahl al-Haq Expands Operations to Syria,” Jamestown Foundation, May 15, 2014, http://www.jamestown.org/single/?tx_ttnews%5Btt_news%5D=42367&no_cache=1#.VTlNmiHBzGc; John Hall, “Shocking image shows child aged under ten being used to fire rockets from car-mounted missile launcher in Iraq against ISIS targets,” Daily Mail (London), December 24, 2014, http://www.dailymail.co.uk/news/article-2885162/Chilling-image-shows-child-aged-ten-used-fire-rockets-car-mounted-missile-launcher-Iraq-against-ISIS-targets.html. Since that time, AAH has continued to act primarily as a militia under al-Khazali’s leadership, though the group maintains a political role. AAH today fights anti-Assad rebels in Syria as well as ISIS in Iraq. Meanwhile, the group has continued to prioritize its role as an anti-American militia, boycotting the March 2015 battle against ISIS in Tikrit because of U.S. military aid.Saif Hameed, “UPDATE 4-Iraq special forces advance in Tikrit, U.S. coalition joins fight,” Reuters, March 26, 2015, http://www.reuters.com/article/2015/03/26/mideast-crisis-iraq-idUSL6N0WS1MM20150326. Al-Khazali also continues to deliver divisive and sectarian rhetoric against fellow Iraqis. In March 2015, al-Khazali said of Iraq’s Kurdish population, “[they are] operating right now like leeches, which feed on the host’s body – sucking more and more of its blood – in an effort to grow in size.”“Iraqi Shiite Militia Leader Qais Al-Khazali: Kurdish Leaders Are Leeches, Sucking the Blood of Iraq,” MEMRI TV, March 24, 2015, http://www.memritv.org/clip/en/4846.htm. AAH ran in the May 2018 national elections within the Fatah Alliance, a coalition of Iran-backed Haashid Shaabi militias. AAH won 15 seats propelling Khazali into a position of political power within the new government.Phillip Smyth, “Iranian Militias in Iraq's Parliament: Political Outcomes and U.S. Response,” Washington Institute for Near East Policy, June 11, 2018, https://www.washingtoninstitute.org/policy-analysis/view/iranian-militias-in-iraqs-parliament-political-outcomes-and-u.s.-response. “The Shia crescent will God willing become a Shia full-moon. And God willing with the return of the Imam Zaman there will be a complete difference in fighting. The Revolutionary Guard in Iran and Hezbollah in Lebanon and Ansar Allah (Houthis) in Yemen and Asaib Ahl al-Haq. Our sister Zeinab and her brothers.”Qais, al-Khazali, “Qais al-Khazali: We are moving ahead with the Shiite Full-Moon Project,” Al-Jazeera (Doha), October 5, 2017, http://www.aljazeera.net/news/arabic/2017/5/10/قيس-الخزعلي-ماضون-بمشروع-البدر-الشيعي. “We have repeatedly heard American government officials saying that Washington wants to remain in Iraq after ISIS for the long haul. This is not something that we want to allow to happen….”Ahmed Majidyar, “Iranian-supported militia leader calls for US exit from Iraq,” Middle East Institute, January 31, 2018, http://www.mei.edu/content/io/iranian-supported-militia-leader-calls-us-exit-iraq. “To the U.S. Secretary of State: your armed forces have to prepare from this point immediately and without any delay to leave our homeland Iraq after the end of the ISIS-presence excuse.”“Hashd commander calls for immediate withdrawal of US forces,” Rudaw, October 23, 2017, http://www.rudaw.net/english/middleeast/iraq/231020173. “We declare out full readiness to stand united with the Lebanese people and the Palestinian cause in the face of the Israeli occupation.”“Lebanese PM slams visit by Iran-backed Iraqi militia chief to Israeli border,” Times of Israel, December 9, 2017, https://www.timesofisrael.com/lebanese-pm-slams-iran-backed-iraqi-militia-visit-to-israel-border/. “We have a good relationship with Iran and there is mutual respect...I want to emphasize that just because we make decisions independently, that doesn’t mean that there might not be any common goals or interests. It is no secret that Iran supports all the militias in this area and we are obviously one of them...”Niqash, “Iraq’s Most Fearsome Shia Militia Leader Speaks Out,” Daily Beast, August 24, 2015, http://www.thedailybeast.com/articles/2015/08/24/iraq-s-most-fearsome-shia-militia-leader-speaks-out.html. “[T]he American project is trying at least to limit the presence of the Hashid Shaabi [Iraqi Popular Mobilization Units] to the borders of Fallujah and not reach Ramadi. This is the magnitude of the pressure from the American leadership now on the Iraqi prime minister.”Samia Nakhoul, “Iraqi militia leader says U.S. not serious about fighting Islamic State,” Reuters, July 28, 2015, http://www.reuters.com/article/us-mideast-crisis-iraq-khazali-idUSKCN0Q22ED20150728. “We do not agree to participate in any area where there are American strikes. We will place full responsibility on the American administration for any strike that happens under the guise of being a mistake.”Samia Nakhoul, “Iraqi militia leader says U.S. not serious about fighting Islamic State,” Reuters, July 28, 2015, http://www.reuters.com/article/us-mideast-crisis-iraq-khazali-idUSKCN0Q22ED20150728. “The Americans do not trust us because we resisted them during the occupation. There is no prospect [for cooperation].”Samia Nakhoul, “Iraqi militia leader says U.S. not serious about fighting Islamic State,” Reuters, July 28, 2015, http://www.reuters.com/article/us-mideast-crisis-iraq-khazali-idUSKCN0Q22ED20150728. “The problem is that the Kurds are operating right now like leeches, which feed on the host’s body – sucking more and more of its blood – in an effort to grow in size.”“Iraqi Shiite Militia Leader Qais Al-Khazali: Kurdish Leaders Are Leeches, Sucking the Blood of Iraq,” MEMRI TV, March 24, 2015, http://www.memritv.org/clip/en/4846.htm. “I think sending our men to fight in Syria was the right decision… Al-Qaida has had a lot of practice in street fighting. If our guys hadn’t gotten the experience in Syria, al-Qaida and ISIS could have taken Baghdad.”“The Fearsome Iraqi Militia Vowing to Vanquish ISIS,” BBC News, July 7, 2014 , http://www.bbc.com/news/world-middle-east-28199741. “To those that are defending Iraq in Syria, because they are fighting there the enemies of Iraq, I tell you all. [C]ongratulations for having the honor to fight there. Congratulations for making history.”Tim Arango and Duraid Adnan, “Iraqi Militants Stage Political Rally, Then Bombs Go Off,” New York Times, April 25, 2014, http://www.nytimes.com/2014/04/26/world/middleeast/militant-rally-in-iraq-ends-in-deadly-sectarian-bombing.html. “Our existence does not depend on the survival of the Syrian regime. Yet we could be hurt and there might be sectarian strife [if Assad falls].”Qassim Abdul-Zahra and Adam Schreck, “Iraqi Shiite fighters’ Syria role raises tensions,” Associated Press, June 10, 2013, http://bigstory.ap.org/article/iraqi-shiite-fighters-syria-role-raises-tensions. “The offense against the Messenger [the Prophet Muhammad] will put all the American interests in Iraq in danger. We will not forgive that.”Lara Jakes, “After prophet film, militia threatens US in Iraq,” Associated Press, September 13, 2012, http://bigstory.ap.org/article/after-prophet-film-militia-threatens-us-iraq. “This stage of the military conflict between the Iraqi armed resistance and the occupation forces is over, with a distinct, historic Iraqi victory and a distinct, historic U.S. failure.”Sudad Al-Salhy, “Iraq Shi’ite militia says ready to lay down weapons,” Reuters, January 5, 2012, http://www.reuters.com/article/2012/01/05/us-iraq-politics-militia-idUSTRE8041LY20120105. “We believe that we have carried out our role regarding the liberation of our country and restoring its sovereignty. This political achievement could not have been done without the Iraqi armed resistance.”Sudad Al-Salhy, “Iraq Shi’ite militia says ready to lay down weapons,” Reuters, January 5, 2012, http://www.reuters.com/article/2012/01/05/us-iraq-politics-militia-idUSTRE8041LY20120105.